Written With A Sword: Can There Be TOO MUCH Fantasy? Can There Be TOO MUCH Fantasy? EDIT: Update as of 20:20hrs (GMT) 17/02/2013 - after feedback, I've only just noticed that the original fantasy authors featured here were all male. This post has been updated to include females. Upon scanning my book shelf, I realised that many of the stories I own are written by male authors. The original observations were in no way meant to intentionally dis-include the female authors of the fantasy genre. Is the fantasy world over-populated? It’s a valid question and one that keeps raising its ugly head in the current era of ‘Lord of the Authors: The Fellowship of the Fantasy’. Without battling out the topic of Indie vs Traditional, I want to take a moment and talk about fantasy worlds. A simple blog post can’t cover every single fantasy tome to have ever graced a book shelf (or a digital market place like Amazon, for all you e-publishing gurus), but we can highlight a few. J.R.R. Tolkien with his elves, and his dwarves, his hobbits with their hairy feet, and his trolls. Ringwraiths, a dark lord, and a powerful artefact that is a curse to all those who bear it. George R.R. Martin with his thrones, and his games, the squabbles of men, and the treachery, futility and thick-fast plots (oh, and if you’ve watched the tv adaptation, there’s a fair share of boobage, too). Peter V Brett – demons galore! How ‘man’ (and woman!) can overcome their fears for what they believe is right. Mark Lawrence explores the moral depravity of a Prince who won’t let anything – or anyone – stand in his way, even if that involves burning the world just to keep warm. Michael J Sullivan brings bromance to the fold (Webster’s unofficial definition of bromance: bro-mance, a combination of brother and romance, meaning ‘a brotherly romance’ between two males. Often seen sharing large quantities of bruises, beauties, and beatings) with a healthy dose of death-defying escapades and swashbuckling adventures. John Gwynne breaths fresh life into the folklore and legend side of fantasy, giving Giants, Wyrms and even Angels a gritty new lease with a Nordic/Celtic feel. Brent Weeks forefronts assassins in one, and mages in another, but above all else they struggle with their own powers for further means. Brandon Sanderson…magic, need I say more? But then again, his world-building is second to none. Joe Abercrombie touts more knives than any sane man should ever need, but lucky for us not all of his characters can be deemed sane enough to count or care for that matter. But when all is said and done, it’s down to being what you’re meant to be, and (as he often states by way of infamous barbarian Logen NineFingers) once you've got a task to do, it's better to do it than live with the fear of it. Ursula K Le Guin, if there was a Big Momma of fantasy, UKLG would be her. Her stories are folklore brought to life, magic and mysticism intoned with a rich world building. Karen Miller strives to break down the old fantasy cliches, using them where she will, but bending and twisting them into something new, pushing 'fantasy' into a more 'fantastical' realm. Robin Hobb, who's back catalogue boasts more tomes than the knives of Joe Abercrombie's cast - claimed by Orson Scott Card to have 'set the standard for the most serious fantasy novel'. Helen Lowe, a newcomer to the fold, but with her fresh blood added to the mix the 2012 Gemmell Award winner (Morningstar category) weighs in with a hefty dose of darker, grittier fantasy and a deeper meaning of how we treat each other. I’ve barely even touched the surface here. I could go on for hours. James Barclay, David Gemmell (big daddy of British heroic-fantasy), Robert E Howard, Patrick Rothfuss, Robert Jordan, Tamora Pierce, David Dalglish, Mazarkis Williams, Moses Sirergar III, Ben Galley, Steven Erikson, Christopher Paolini…ok, ok – I’ll stop. So, fantasy is a busy world(s). But each and every one of them is different. Yes, a lot of them share themes or creatures (elves, dragons, hobbits, dwarves, damsels in distress…hobbits, or other creatures with hairy feet? ), but would you really say: ‘No more’! Heck, I’m sure if you asked a lot of these authors they’d admit to being inspired by one another. Of course they would. Ok, let’s imagine if someone said ‘No more’ to Robert Jordan. Would we have the Peter V Brett’s, and Christopher Paolini’s of today? ‘Put that pen down’ David Gemmell…and voila, no John Gwynne’s or James Barclay. How many would we lose if Robert E. Howard had run out of ink on the first page, and Conan had been lost to an unfinished sentence? IMAGINE THE CHAOS if someone told J.R.R. Tolkien to shave his hobbit and write a romcom. Think of the children, pray for their futures! A Fantasy author isn’t just for Christmas. They’re for life. (And even then, they’ll think of a way to come back and haunt you from the afterlife – they’re fantasy authors after all). 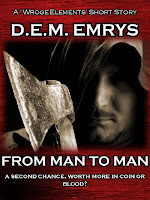 D. E. M. Emrys. Author. Soldier by day, Soldier by night - Writer in Between. From Man to Man - Currently FREE from Amazon. Fantasy and SF have risen and fallen in comparison to each other over the decades. I am old enough to remember when fantasy was derided, and SF was the "Real" genre of the two. The first two decades of the 21st century seem to be fantasy ascendant. One thing, kindly pointed out by a friend. Where are the women writers on your list, though? Yeah, where's the ladies? Cos at the minute, your list is perpetuating the notion that women don't write fantasy - or only write the kind that involves leather pants and boinking. And if that's actually what you think, then sir, you are criminally under-read in the genre. It may come across this way - but it didn't even cross my mind. Scanning the 'favourites' on my book shelf, I have to admit it is mainly populated by male authors. Even a swift amazon search of popular fantasy (I searched Pat Rothfuss and browsed the 'Customers who viewed this also bought' function). Agreeing with the last comment. Sure, most fantasy authors are male, but not by much. It's probably around 40% female, or higher. But not one female name? Isn't that just a tiny bit odd? True again - but without knowing, my book shelf is mostly dominated by male fantasy authors. A quick search of Amazon reveals a similar trend. Why do you think there are more male than female fantasy authors? There aren't significantly more male authors than female, if you take the fantasy genre as a whole (I had a link to some stats but I can't find it). However, there is an abiding perception that this is the case. Where does this come from? It feeds on itself. The popular stay popular. I don't really understand how Amazon's recommendation engine works, but I suspect even that is skewed by the popularity ratings. Guest Post: Sci-fi Author, Doug Strider. Review: Space Danger! The Deadly Planet of DEATH!